Het Gemenebest van Naties, voorheen het Brits Gemenebest, is een vrijwillig samenwerkingsverband van 53 onafhankelijke soevereine staten, met de Britse koningin Elizabeth II als symbolisch hoofd. De staten die lid zijn van het Gemenebest worden zelf aangeduid als gemenebestland of commonwealth. Very impressive but totally meaningless unless shown as a percentage of those countries total exports/imports. I remember someone on here put up an impressive number as Britain's total coal reserves which was, on the face of it, a very big number but they were the equivalent of Queensland's coal exports for one week (something like that). Figures like those quoted mean absolutely nothing by themselves. Realist and statistics are like a down-and-out and cheap booze, frequently seen together but ultimately a very unreliable and unproductive combination. 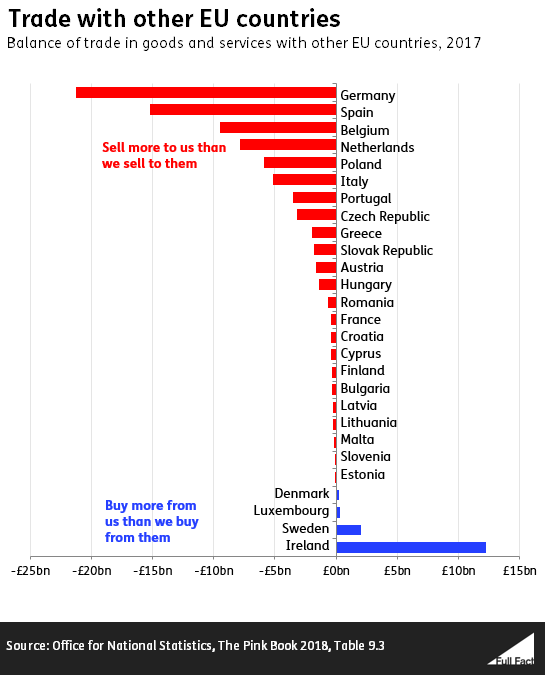 Statistics can be very misleading, as you say in percentage terms the UK loses a lot more than the EU. They are also misleading as they refer solely to the EU and in the event of a No Deal we leave not only the EU but the biggest free trading bloc in the world, a third of the worlds economy. .... and more expensive goods. You seem to miss that bit out. Just because there are no tariffs, does not mean the price of a "widget" from the EU is cheaper than the same "widget" bought from the USA. So.. the EU widget goes up in cost to £1.05 (including the 0% tariff) because they know they can charge more and still be the cheapest overall. But ... the EU widget is now (cost price) more expensive than the same one from the USA (£1.05 EU vs £1.00 USA). We then leave the EU and its customs union complete with BS tariffs that favour German manufacturing and French farming. But, because don't make widgets in the UK the logical thing to do is to remove tariffs on widgets completely (for imports from the whole world - WTO rules). Which means, we buy them from the USA (instead of the EU) because the unit cost is cheaper. UNLESS - the EU LOWERS their cost price to compete. This is a massive problem for the EU - I mean ... HUGE problem. You may say, transport costs from the USA are more expensive, but in reality, it would not offset the unit cost price differential. Take China and shipping costs - the goods from China are still cheaper overall. Yes, we can cut tariffs and import cheaper. There is no requirement on others to cut their tariffs on our goods in the same way. We are the 10th largest exporter in the World and we will still need to export to earn the foreign currency required to buy our imports and pay our debts. We simply cannot compete against those nations which have a very low manufacturing cost base. That is why to the WTO has Tariffs and Free Trade deals, to even up the playing field. This is where Non Tariff Barriers under WTO Rules come into play. China has a huge number of Non Tariff Barriers to protect it's industries. We only have 50 days to go and we have not yet published our WTO Schedules. It is impossible for industry to plan ahead under these circumstances. I will repeat, I am not against Brexit, I am critical of the mess we have made of it. If we had gone for a straight WTO Free Trade Deal like Canada , Japan and the others, we would have been out next month, no need to pay for a Transition Period and our industry would have had time to plan. There would have been no Northern Ireland Border issue, as goods and agriculture are tariff free and you do not need a hard border for services. Swimfeeders, please don't take this as a criticism of any kind, I am just trying to understand. If, under WT rules we remove tariffs for an imported commodity, don't we have to remove them from all commodities from wherever they originate? Yes - for that commodity.